15 best pressure cooker under Rs.3000 - Best pressure cookers! 15 best pressure cookers under Rs.3000 – Affordable premium pressure cookers for your kitchen! The reason why pressure cookers are popular among Indian masses is due to the versatility of this utensil. It significantly reduces the cooking time and cooks delicious and healthy meals. These are safe, easy to use with a variety of types offered for different users. Your main task is to choose best pressure cooker that is affordable, versatile and long-lasting. Indian cooking is exhausting and no one can afford to change utensils every month. When Indian housewives buy utensils they keep the long-term application in mind. There are a whole lot of pressure cookers available at different sizes, functions, base, and purpose. You must know about each of them before finding the best pressure cooker for you. First generation: It is the old type. It uses weight modified value which releases pressure suddenly. Second generation: They use spring-loaded values. These are hidden from the eye view. They also sometimes show how far the steam level has reached instead of releasing it. There are dials that help you adjust the steam inside. Electric cookers: They come with an electric source at the base. This base helps in regulating the pressure and heat with power. They have an ability to keep the food warm. Single purpose: You cannot control the outcomes in these types. They have a single pressure setting. They can be used naturally to make any kind of dish. Multi-purpose: They don’t only cook but also steam and sear. They come with different temperature, pressure settings. They can be converted into slow or rice cookers also. This cooker comes under Rs.1500 and offers a whole range of offers for you. It can handle any type of cooking. It has a handle to ensure your safety while cooking. Heat resistant valve cap and rubber gasket are also included with it. Strong grip handle is dedicated for long-lasting use. Induction based cookers are already ruling the market. It is manufactured from pure aluminium and boasts of high-quality materials. Comfortable handles and gasket release system is provided efficiently. Its compatibility to be used in induction cooktops is its best feature. It is available at a cost-effective price range of Rs.2000 – Rs.2500. It provides you with the strength of anodisation and convenience of aluminium. Prestige deluxe plus has a pressure indicator which enables you to cook smartly through its induction based base. This particular Prestige deluxe plus has a controlled GRS also. Almost with the same features as the above-mentioned model, this cooker is available at higher prices and boast of higher quality material used. With its new sleek design and look, it matches with any kind of kitchen model you have. The aluminium does not react with food and with a well-built construction body you get to have steady cooking. It saves more energy and absorbs heat faster. Rice, vegetables or even meat can be cooked in one-third time than original in this cooker. It is the best pressure cooker if you look for a sleek body, steady cooking and packed features within the price range. This Butterfly pearl plus is easy to clean, perfectly curved and beautifully created pressure cooker. It is safe to use and comes with versatile functions. 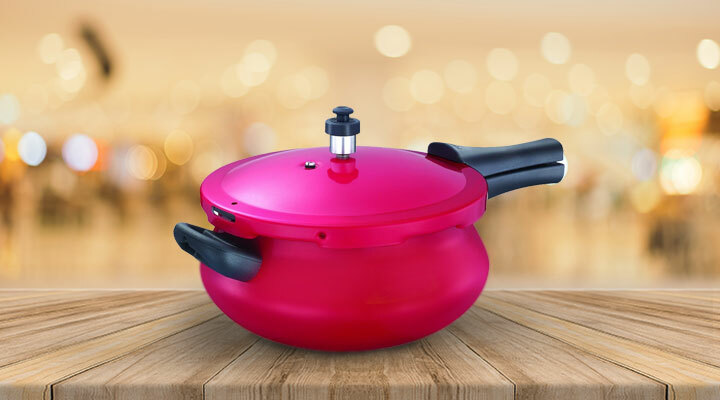 Butterfly pearl plus can be used for gas, electric plates, stoves, and induction. It is priced at Rs.1750 and therefore completely under your budget. Bajaj majesty DUO comes with both outer as well as inner lid version. It has a fuel efficient base with induction compatibility. This Bajaj majesty DUO has an easy to fix rubber ring gasket, standard fixed value, and optimum pressure handling. Steam emission is perfect with the price range of just Rs.1675. This 3L variant is available at affordable prices. Prestige Deluxe alpha is the best pressure cooker in terms of material and quality. It can be used on an induction top as well as a gas stove. This Prestige Deluxe alpha has credible durability and a heavy body with manufacturing warranty of 10 years. This Hawkins stainless steel can certainly be counted on the list of the best pressure cooker. It saves fuel and ensures safe and uniform cooking. Hawkins stainless steel is designed to prevent corrosion. It comes with a manufacturing warranty of 5 years. Nakshatra plus can be used for a variety of purposes. It comes at a range of nearly Rs.1300-1400. Prestige Nakshatra plus comes with an induction base and is affordable. It is certainly the best pressure cooker when it comes to price affordability and features.it has no induction base but offers quality cooking at gas for just Rs.945. This pressure cooker is mainly the same as the previous one but with more capacity. Still, it is the best in terms of price affordability. Price – Rs. 1263. It is a 4.8 Litres flame red pressure cooker with base suitable for both gas and induction. This Prestige deluxe plus junior induction base pressure handi comes with 5 years manufacturers warranty at a price of Rs.1860. Deluxe Plus Aluminium Pressure Cooker is the most versatile pressure cooker available. This cooker comes with a price of Rs.750-800. It has an induction based base and is extremely affordable. It is the best pressure cooker if you want induction and gas based cooker for less than Rs1000 and long-lasting credibility. In the end, it’s your choice but to make it easier we have listed these best pressure cookers for you and your family’s healthy and happy life. Before you buy a pressure cooker make sure you adhere to the safety norms and choose from the best. I want a pressure cooker but haven’t purchased one yet. Thanks for the great recommendations! These are an amazing list of pressure cookers! Wow, I never knew there were so many premium varieties of pressure cooker!